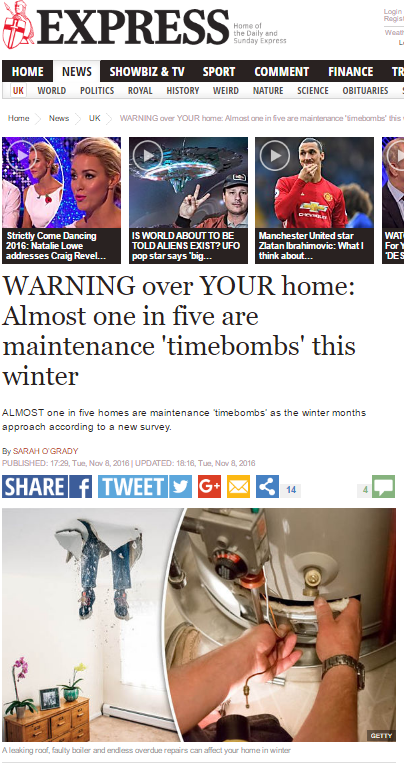 ALMOST one in five homes are maintenance ‘timebombs’ as the winter months approach according to a new survey. Leaking roofs, broken boilers, blocked guttering, blown electrics and rising damp are only a taster of the problems hitting owners in the pocket as they strive to keep their home in good condition. In fact, for 18 per cent, owners of 3.2m properties, their dream home has turned into a maintenance nightmare which they lose sleep over, according to a new survey. Nearly half (48 per cent) of the 1,800 owners questioned by insurers LV= admit they do not have the knowledge or skills to do their own maintenance work around the house. Selwyn Fernandes, of LV=, which has just launched a free online property MOT service, said: “Keeping up with home maintenance can be a tough and time-consuming job, so it’s understandable that many homeowners might ignore problems or put off important work. This entry was posted in LV= and tagged Express, lv=, Sarah O'Grady, selwyn fernandes on November 22, 2016 by Michael Marshall. When it comes to holidays, some Britons know what they like as 2million return to the same resort and do the same thing year after year. 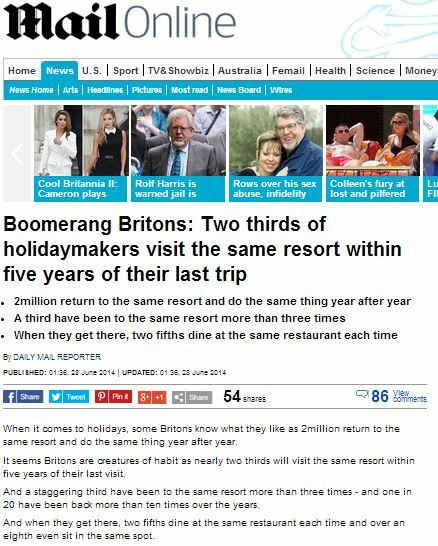 It seems Britons are creatures of habit as nearly two thirds will visit the same resort within five years of their last visit. And a staggering third have been to the same resort more than three times – and one in 20 have been back more than ten times over the years. Say what you like about the term ‘boomerang Britains’ (personally, I choose to say it’s an annoying piece of made-up marketing nonsense designed to placate the papers), but it seems we’re all terrible predictable when it comes to our holiday destinations. But LV= travel insurance, who commissioned the poll, found familiarity stops a third taking out insurance because they feel they know what to expect. Selwyn Fernandes, from the insurance company, said: ‘Travelling to somewhere you have been to before can make planning a holiday much simpler. ‘It is easy to let your guard down because you already know the destination but things can sometimes go wrong when you’re on holiday. I guess the message from LV= is clear – you can be as boring as you like on your holiday, so long as you keep buying insurance from LV=. This entry was posted in LV= and tagged daily mail, daily mail reporter, lv=, selwyn fernandes on July 4, 2014 by Michael Marshall. Forget romantic walks along tropical beaches or candle-lit suppers in European capitals. More and more British holidaymakers are opting for “me time” and going away without their partner, according to a new survey. The gifted but solitary British psychiatrist Anthony Storr famously told his patients that “the capacity to be alone is necessary if the brain is to function at its best”, echoing the old cliché that “time apart” is crucial in forging a happy and lasting relationship. 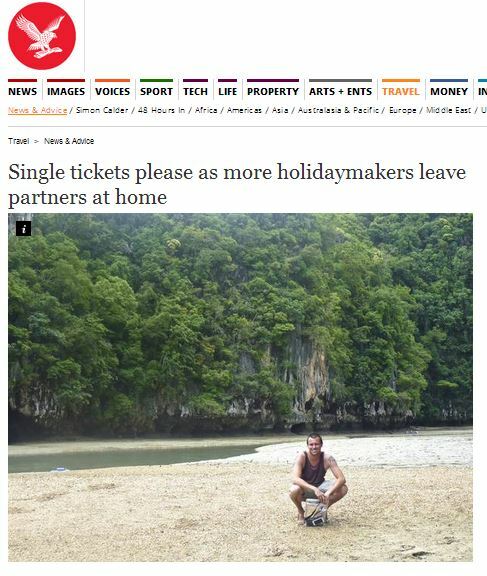 It’s advice the holiday-going public are obviously taking to heart with “solo breaks” becoming the escape of choice for 27 per cent of people, who admitted they ditched their lovers for solo trips or holidays with friends last year, compared to just 10 per cent a decade ago. 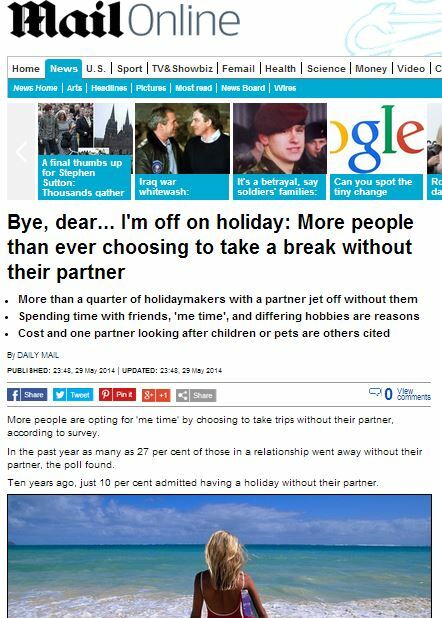 More people are opting for ‘me time’ by choosing to take trips without their partner, according to survey. In the past year as many as 27 per cent of those in a relationship went away without their partner, the poll found. Ten years ago, just 10 per cent admitted having a holiday without their partner. This entry was posted in Uncategorized and tagged daily mail, jamie merrill, liverpool victoria, lv=, selwyn fernandes on May 30, 2014 by Michael Marshall.